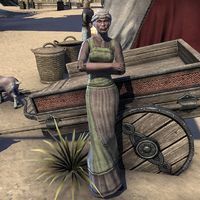 Adelizza is a Redguard merchant found in Bergama's marketplace around Bleached Skull Blades and Crown's Glory Armaments. She has only generic dialogue. This page was last modified on 7 July 2018, at 06:46.